The complaint filed in U.S. District Court in Seattle describes the refusal of asylum and separation of families as a "cruel and unlawful policy" that has already taken more than 2,000 immigrant children and infants from their parents. 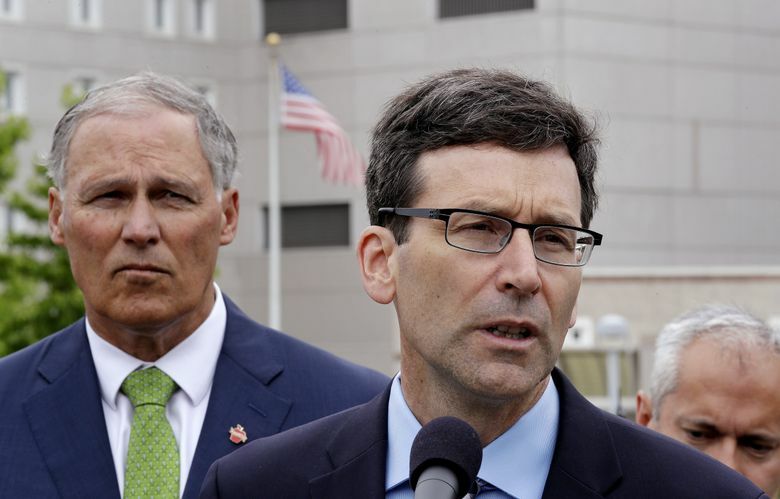 As expected, Washington’s Attorney General Bob Ferguson has challenged the Trump administration in court over its policy to forcibly separate immigrant families, contending in a lawsuit filed on behalf of 17 states and the District of Columbia Tuesday that President Donald Trump’s “zero tolerance” immigration policy violates constitutional due-process rights of parents and children and runs afoul of federal asylum laws. A spokesman for the Department of Justice in Washington, D.C., declined comment Tuesday. “The Order says nothing about reuniting the families already ripped apart by the federal government, and Trump Administration officials have made clear the Order will have no impact on the thousands of families who have already been traumatized,” the lawsuit states. Trump and his administration have blamed Congress for failing to act to fix immigration laws and putting “the Administration in the position of separating alien families to effectively enforce the law,” according the order. Trump’s order also directed Attorney General Jeff Sessions to file a request with the U.S. District of California to modify its 1997 “Flores” consent decree that holds that children can be detained in confinement for no more than 20 days. In 2014, President Obama also tried to hold immigrant families together indefinitely, though that policy was found in violation of the consent decree. Last week, when Ferguson announced that he intended to file the lawsuit, he took the position that Trump’s executive order was meaningless because, among other things, it depends on passage of a congressional appropriation that may never happen as well as a judge’s ruling to change the Flores decree. Other states joining Washington in the suit are Oregon, California, Massachusetts, Delaware, Iowa, Illinois, Maryland, Minnesota, New Jersey, New Mexico, New York, North Carolina, Pennsylvania, Rhode Island, Vermont and Virginia. The lawsuit comes a day after the nonprofit Northwest Immigrant Rights Project sued the Trump administration on behalf of three Central American women held in federal custody in Washington state, contending it is unnecessarily prolonging the separation of asylum-seeking immigrants from their children. That suit seeks class-action status on behalf of dozens of other immigrants separated from their children and detained in Washington state.